System basis chip for three-phase brushless DC motor controllers designed in the Microchip 0.18-µm SOI technology SMART-I.S.™. 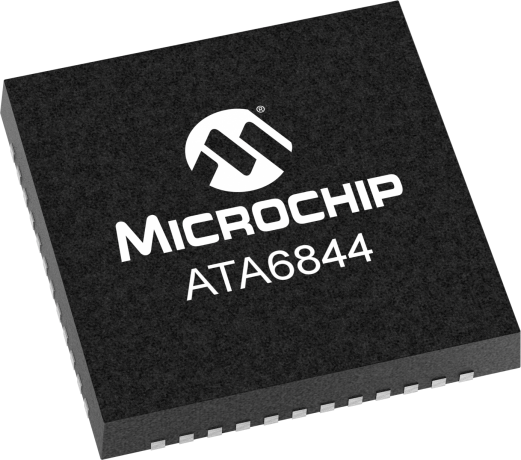 The chip forms a BLDC motor control unit for automotive applications in combination with a microcontroller and six discrete power MOSFETs. Works in extended supply voltage range from 5.25V up to 32V. It features a Tjunction of up to 200°C. Its circuits provide a 3.3V/5V linear regulator and a window watchdog. It includes various control and protection functions like overvoltage and over-temperature protection, adjustable short circuit detection, undervoltage management and coast function. Its drivers fulfill maximum safety requirements and offer a high integration level to save cost and space. The development kit contains a main board with an H-bridge gate driver (ATA6823), external FETs, and DC motor. The controller board is populated with an ATmega88 microcontroller and LCD display. Intention of the kit is demonstrating the features of the ATA6843/44 System Basis Chip BLDC Gate Driver. Motor position feedback operates with Back-Electromotive-Force (Back-EMF). Motor control microcontroller is ATmega32M1. For monitoring and evaluating purposes is an USB interface on board.